The introduction to "The Adventure of the Norwood Builder" is a little different. Remember the start of "A Scandal in Bohemia," when Dr. Watson goes on and on about Irene Adler, a remarkable character we'll meet in that story? We get very used to all the introductions where Watson goes on and on about Sherlock Holmes later in the series, but Irene was first. Irene was special. And outside of Sherlock Holmes, we don't get a Watsonian emphasis on anyone other than Irene at the start of a story, as the word limit of these short stories demands such a start means said person needs to be a very important part of that story. Which brings us back to "Norwood Builder." In the opening to "Norwood Builder," we learn more about Professor Moriarty than any other story outside of "The Final Problem" and The Valley of Fear, both of which directly involved Moriarty's plottings and Holmes dealing with him. "Petty thefts, wanton assaults, purposeless outrage -- to the man who held the clue, all could be worked into one connected whole." "The faintest indication." "The smallest trace." Sherlock Holmes speaks of how subtle Moriarty could be in his machinations. That "purposeless outrage" as a tool of the criminal mind is something we're all becoming more aware of now, in 2019, but Moriarty was a century ahead of his time even in that. And while it was Sherlock Holmes who tells us the most about Moriarty in "The Norwood Builder," it is Watson who decided those words needed to be in the beginning of the tale, even though it is completely unrelated to John Hector McFarlane showing up out of the blue. So why Moriarty? Did Watson just want to use Moriarty's name to gin up interest in a mediocre story to follow? Except "Norwood Builder" isn't exactly a mediocre story. It's a tale of . . . [Okay, serious question . . . do we even do spoiler alerts at this point? Or do we just decide the freshness date of a given reveal and decide for ourselves? Anyway, back to Norwood.] it's a tale of a man who fakes his own death. Let's repeat that, since I went off on that tangent: "Norwood Builder," which begins with the rare praise of Moriarty's remarkable abilities, is a tale of a man who fakes his own death. Professor Moriarty is well known to be dead, thanks to John H. Watson and The Strand Magazine. And, according to Watson, when Holmes brings up London being more interesting with Moriarty around, the British public would much rather Moriarty remain dead. If a man like Moriarty turned out to have faked his own death, and Sherlock Holmes could remove him from play a second time without the public's knowledge . . . and subsequent mistrust of any fact from Watson, Scotland Yard, or the public press . . . might Holmes not just go ahead and quietly remove the professor a second time? Curious thing isn't it? Makes one wonder. Needs a little discussion. Luckily, the Sherlock Holmes Story Society is having its monthly meeting at the North Branch Peoria Library tomorrow night at 6:30, and the story under discussion? "The Adventure of the Norwood Builder." I always blog a little less when a certain Peoria-based podcast is being produced. It's one more of those little points that always raising the question, why do so many people feel the need to do a podcast? There are an insane number of podcasts out there, all sharing the limited ear-time of the limited number of folks who have decided podcasts are a thing to listen to. People have many motives for doing podcasts, but most probably also do it for one very basic reason: It's a broadcast medium that isn't hard to gain entry to. You don't have to join a network, be photogenic, have massive resources, or even that much skill. You don't have to be a talented writer if you've got a little personality or depth of thought. And the range of possibilities for podcasting is so very wide open. I was really hit hard by this yesterday as I listened to Ron Burgundy talking to Deepak Choprah on a podcast. The former, if you don't know him, is a fictional news anchorman that Will Ferrell loves portraying at any given opportunity. The latter is a real person. So when an actor well known for playing Sherlock Holmes (at least this January) started crossing that fictional/factual line, my immediate thought was, of course, "Why doesn't Sherlock Holmes have a podcast?" But now that I've had the thought of Sherlock Holmes doing a podcast, and seen that the likes of Ron Burgundy can do it, I have a new item on my Christmas/bucket/wish list: I really want to hear Sherlock Holmes podcasting. It's way beyond my own meager podcast skillset, but surely someone out there has the skills to pull it off. P.S. I hope John Watson is on the podcast, too! Here's a question that treads upon all sorts of dangerous ground: If Conan Doyle were alive today, would he be a celebrity anti-vaxxer? How would he feel about climate change? The answers are impossible to make with any certainty. T'were Conan Doyle born in 1959 instead of 1859, and a Baby Boomer at that, he would not have come out nearly the same man he was back in the day. The whaling adventures would have been off his resume, and his medical training would have been a very different thing. We would hope he would still be a doctor and writer, and not a child who succumbed to watching Gilligan's Island incessantly at a young age. So why do I pose this question? "For what is science? Science is the consensus of opinion of scientific men, and history has shown it to be slow to accept a truth. Science sneered at Newton for twenty years. Science proved mathematically that an iron ship could not swim, and science declared that a steamship could not cross the Atlantic." Admittedly, these are the words of a narrator whose sole purpose is to convey a certain feeling in the reader at the story's end, empowering the mystic threats of faraway lands. They are the words of a character Conan Doyle created, just like John Watson, Charles Augustus Milverton, etc., and as Conan Doyle himself wrote in "To An Undiscerning Critic," "The doll and its maker are never identical." But as Stashower used those lines to lead into the subject of Doyle's transition to spiritualist beliefs, that context does leave one to wonder. But there are a great many aspects to Conan Doyle's personality that make one wonder what he would be like as a contemporary. Leaving spiritualism and fairies behind, trying to guess what form Conan Doyle's socially active nature would take, what causes he would champion, what investments he would have poured his profits into . . . this was not an easy man to predict, even in his own time. A Conan Doyle born in 1989 would be far different from even the same man born in 1959, and a Conan Doyle who could take selfies by age eight? Who knows where that kid would be headed? It makes interesting dinner conversation, if nothing more. 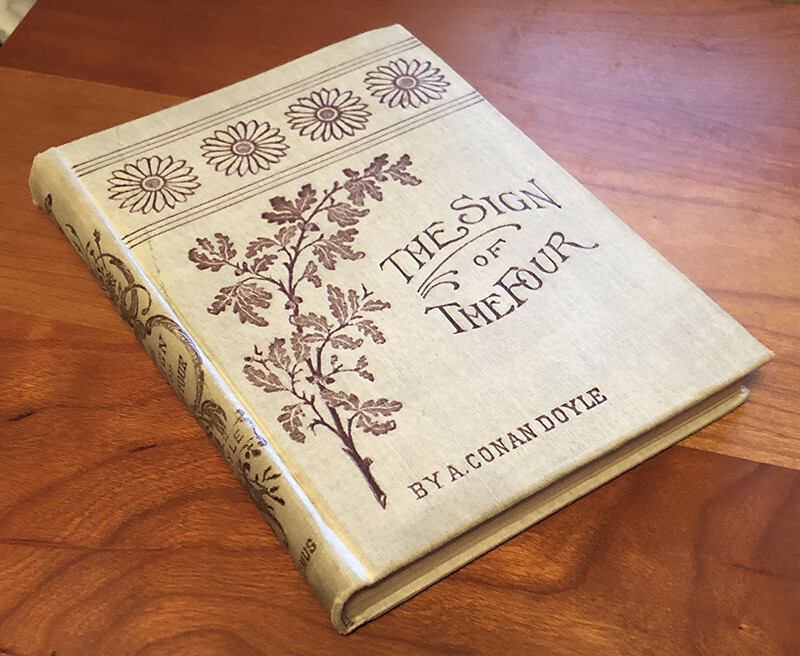 Each of us can only attempt to live our best lives in the era we're born into, and we have to trust that Conan Doyle did that very thing. The celebrity gossip machines of our current era, however, would surely have love that guy whichever direction he went. Walp, it's awards weekend, and bad comedy is in full bloom. Whether it's the badly-read cue card jokes of Oscar presenters or the announcement of the Golden Raspberry awards by some ex-UCLA film students. And the latter, known as the "Razzies," for short have targeted our friends Sherlock Holmes and John H. Watson this year. More specifically, the Razzies named the Will Ferrell/John C. Reilly comedy Holmes and Watson as their "Worst Picture of the Year," along with calling John C. Reilly "Worst Supporting Actor," director Etan Cohen "Worst Director," and giving the movie "Worst Remake, Rip-off, or Sequel." The only reason Will Ferrell probably didn't get the win for "Worst Actor" was that he was up against Donald Trump, and Trump-hatred understandably trumps everything right now, even in parody awards. Some Sherlockians will surely agree with the Razzies, but some Sherlockians don't go to the movies all that often, and don't really have a complete view of what movies appeared in theaters throughout all of 2018. To say that Holmes and Watson, a to-your-tastes comedy that only showed up in the last six days of 2018, was the worst movie of that entire year is plainly a symptom of either no long-term memory, strong anti-Ferrell bias, or both. 2018 had some really awful movies in it. Looking at various top ten "worst" lists for the year, one sees some very different results. WatchMojo gave Sherlock Gnomes a dishonourable mention, but ignored Holmes and Watson. The Rolling Stone completely ignored both Sherlockian movies and only put one comedy on its list, The Happytime Murders, which made a lot of lists, and actually made this Sherlockian walk out of the theater for sheer boredom and the chance to spend the remaining minutes doing something more entertaining like shopping for groceries. Time ignored Holmes and Watson. CBS News placed Sherlock Gnomes at 29th worst movie of 2018 in a list of sixty-one bad movies that didn't include Holmes and Watson. And IMDB even made Sherlock Gnomes its 19th worst movie of 2018 in its list of ONE HUNDRED MOVIES, and ignored Holmes and Watson. The Golden Raspberry people plainly jumped on an internet bandwagon at year end, as they attempted to come up with the most click-baitable nominations to get attention, rather than fully considering the year's full menu of bad films. If one were to hand out a "Lazzie" award for laziness in award-giving, they would surely be nominated. Still, any year with two theatrically-released Sherlock Holmes movies in it is still a banner year for Sherlock Holmes fans, no matter what the final judgment on those films winds up being. And for that, I'll give 2018 Sherlockian cinema a big thumbs-up. There's a viral sort of ailment that has reached epidemic proportions of late, and interestingly, one that Sherlockians have carried longer than almost anyone. It's there in the word "Sherlockian," so we can't even come close to denying it. The ailment? Attaching one's self to a product or other commercial entity so closely that it becomes a part of one's identity. Okay, okay, one immediate argument against that statement would be "but Sherlock Holmes is not a commercial entity, he's a literary one." 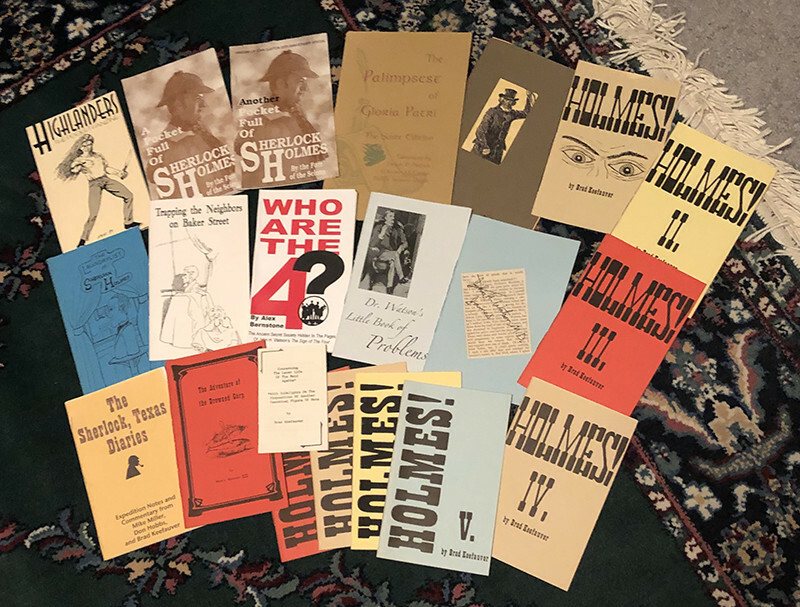 If one happened to save the receipts on all the money one spent based on one's love of Holmes last year, that defense goes right out the window. And Conan Doyle got paid, The Strand Magazine got paid, even Columbia Pictures and the other producers of that beloved film Holmes and Watson got paid . . . something. But what's the harm in letting such things become a part of one's identity? Hobbies bring us pleasure, right? And fandoms bring us community, right? Good things! The danger comes when one cedes any part of one's identity to an entity completely outside one's control. Take the fanboy attacks on any major film franchise that goes a direction said fanboy doesn't like. It isn't just that our example fanboy didn't like the turn a new movie in his fave franchise took. It's that the turn involved felt like an attack on his identity, that part of him built around the tropes and original elements of an earlier part of that work. And out comes that crazy-looking rage and ridiculous statements like "They ruined my childhood!" or "Anyone who likes this isn't a valid human being!" When the battle over character rights started freeing up Sherlock Holmes, many a Sherlockian felt a sense of relief for just this reason. No corporate entity would have the potential to command Sherlock's story to their choosing. Yet even at that point, Sherlockians had developed a certain immunity toward the pains that come when one makes an external creation a part of one's identity. So many Sherlocks have come and gone over the last century or so that no single Sherlock Holmes, not even the one in Doyle's sixty stories, commands complete control over what any of us feels Sherlock Holmes is. Ideally, we can headcanon Sherlock all day long and not feel too threatened by any other variation, because we should have been inoculated by a thousand other Sherlocks over time. Newer Sherlockians may not immediately have this immunity. Season four of BBC Sherlock hit hard because, despite all of fanfic's beautiful variety, it was a painful hit to versions of Sherlock internalized from previous seasons. Older Sherlockians aren't automatically immune either -- and often the worst ragers of all when a new Holmes dents the view of Sherlock Holmes they've made a part of their identity. (Have I lost my anti-Elementary reputation yet? Surely not, because I still could go off at any minute, even though the therapy seems to be working.) Any time a person confines themselves to a strict diet of one kind of Sherlock over the years, or even just a personal views that they've built up over time, they are also going to feel very vulnerable when Sherlock Holmes starts doing something he never did in their identity-221B. The slogan "All Sherlock is good Sherlock" might seem a little naive at first, but at least attempting it as a credo is like getting an annual flu shot so your body can adjust itself to viruses it might encounter down the line, so you don't spike a fever of outrage when an unexpected and unwanted Sherlock comes along. You can go into a little quarantine group of folks who adhere to exactly your identity's Sherlock Holmes and try to hold out as long as you can, tucked away from the world, but that just does not seem like a healthy strategy. Eventually, we all have to leave the house. Because there are some really good Sherlock Holmes bits out there. Really good. Good enough that we can't help making them a part of our inner and outer lives. We just have to be prepared for the inevitable infection of those other Sherlocks, Sherlocks we might be allergic to, and the carriers of those Sherlocks, who could be pretty nice people. You'll have to forgive me as I blunder through this particular blog post. The subjects involved just make me a little stupid with their looks, a failing many of us have. We come to Sherlock Holmes via many different doors. And this week, a Sherlockian of note pointed out another one, even though his focus was on something fascinatingly non-Sherlock, yet totally a part of what made Sherlock Holmes what he was. I'm speaking, of course, of the second episode of Mattias Boström's podcast Talk About Sherlock. I'll let you discover the fresh insights Mattias has to offer on your own, but suffice it to say that it sent me digging through my own little collection of ancient volumes, looking at title pages, dates, etc. with new eyes. 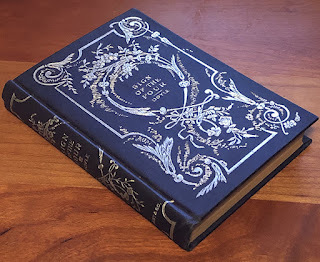 One particular little volume I'd forgotten about caught my attention, a pretty little edition of Sign of the Four, as the cover reads. Which, it turns out, wasn't even the edition I wanted to write about. But I have to show you anyway, so you can see how this might not be my best attempt at writing a blog. Anyway, there was this other attractive little number. 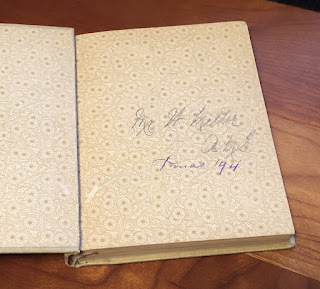 Inside the front cover is Mrs. W. Miller's name, along with some initials, and a date of Xmas '94. 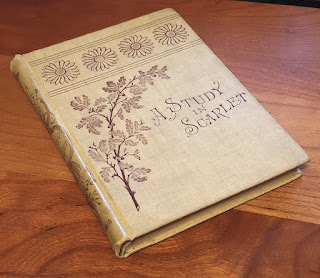 After listening to Talk About Sherlock, I came to muse upon how many Americans may have actually started their reading of the Sherlockian Canon with The Sign of the Four and not A Study in Scarlet or The Adventures of Sherlock Holmes. There was that period of time, in the early nineties, when one was very apt to just discover that single book, The Sign of the Four, without realizing that Sherlock Holmes had already appeared in another novel, or that short stories of the detective were being published in periodicals. Matching sets of Sherlock Holmes books were not as common as they would later become, and the character Sherlock Holmes? A fellow in "a" book, to so many who encountered him. Yes, Mrs. W. Miller's book was given to her in 1894, after Holmes was starting to bloom and boom, but could Mrs. W. Miller have been one of those folks who came to Sherlock as a character in The Sign of the Four first? To my mind she had to be. It looks like A Study in Scarlet and The Sign of the Four were a "couples" gift. Mr. W. Miller got the first book of Holmes, while Mrs. W. Miller got the second. Since I probably picked up both books at the same place, the chance that they were split up in a divorce settlement isn't very likely. But did the Millers know that there was an order to the books? Or did they sit down one evening a couple days after "Xmas" and each start reading their own gift ... in which case Mrs. Miller did read The Sign of the Four first. And what an interesting conversation that would have been between the Millers, with one meeting Holmes in STUD and one meeting him in SIGN, simultaneously. I'd have loved to be a fly on that wall, back in the day before anyone's knee-jerk reaction was to scream "SPOILERS!" and shut down a conversation to protect their own novel virginity. It would seem that Victorian London . . . and maybe the world . . . was once populated by tiger-men. One need only look to the evidences of the Watsonian record to see that it must be so. San Pedro had a tiger of a man ruling it for twelve hard years. A ferocious youth named Tiger Cormac prowled the mining country of Pennsylvania. Yet less obvious are those fellows with the tiger-spring in their legs. Jack McMurdo, Philip Green, and, of course, Sherlock Holmes. That later set of tiger-men serve the side of good, and at least two of them bring out their tiger-springs due to caring for a woman. The other for the love of a friend, and also for justice, as do all three, really. The latter of those tiger-man even uses his tiger ability to take down another whom he recognizes as a tiger-man . . . perhaps a case of the younger, stronger cat taking down an old rival. "The empty house is my tree and you are my tiger," Sherlock Holmes said to Sebastian Moran after leaping upon him like a tiger himself. Moran is a known killer of tigers, it is true, but we see the tiger-man metaphor used so much in the Canon of Holmes that one has to wonder if Moran's prey weren't fully bestial at all. When he's caught in "The Empty House," he's stalked and killed at least one two-legged prey and is attempting to take down another. John Watson, whose military career met setback after setback in the land of tigers seemed to connect himself more with the tiger cub than the fully grown version of the beast, and when Sherlock Holmes quotes "There is danger for him who taketh the tiger cub . . ." one must wonder if he is musing upon Watson's departure from Baker Street. The second part of the quote, ". . . and danger also for whoso snatches delusion from a woman," might be Holmes cautioning himself against revealing some truth to the woman who took Watson from Baker Street, and nothing to do with Miss Mary Sutherland at all. Watson is well aware of the tiger-men of England, as he lets on in his write-up of their night-time vigil in "The Adventure of Black Peter." "What savage creature what is which might steal upon us out of the darkness? Was it a fierce tiger of crime, which could only be taken fighting hard with flashing fang and claw . . . ."
Does Watson see himself with those fangs and claws, or is it his companion, the man he has already spoken of as a tiger, knowing that Sherlock Holmes is the alpha tiger in whatever may come? The use of men described as tigers in the Canon of Holmes happens enough that it is no mere happenstance. And the tiger-man who appears most often is easy to see -- he's the star of the show, as such a tiger should be. It makes for an interesting meditation, as we don't see nearly so many of that sort these days. Being a tiger-man probably isn't the most conducive thing to having tiger-babies, as a quick survey of the Canon will also tell you. But at least we have some prose evidence that they did once exist. When the founder of "Doyle's Rotary Coffin" first lured us in with fine membership cards to make vows to honour the code "All Holmes is Good Holmes," I think we all took a lot at the actors whom we didn't think should have played Sherlock and went, "Okay, maybe I can tolerate that one." A sacrifice, yes, but with the promise of working toward universal acceptance among our fellow followers of Sherlock Holmes? Not nearly that great an act of self-control. So off we went, down that happy path, agreeing that all attempts to portray Sherlock Holmes on screen must have some merit. But even a simple and clear statement like "All Holmes is Good Holmes" can have a monkey's paw of fine print hidden within it. Do those words say anything about actors? Characters in one medium or another? Are movies the limit? Is television? Novels? Short stories? I have these socks. A thoughtful gift from wonderful kinfolk. I'm sure you might have seen them in your favorite bookstore or perhaps online. A nice little addition to the Sherlockian collection. But I'm addicted to cotton fluffies. Thick, comfy socks. 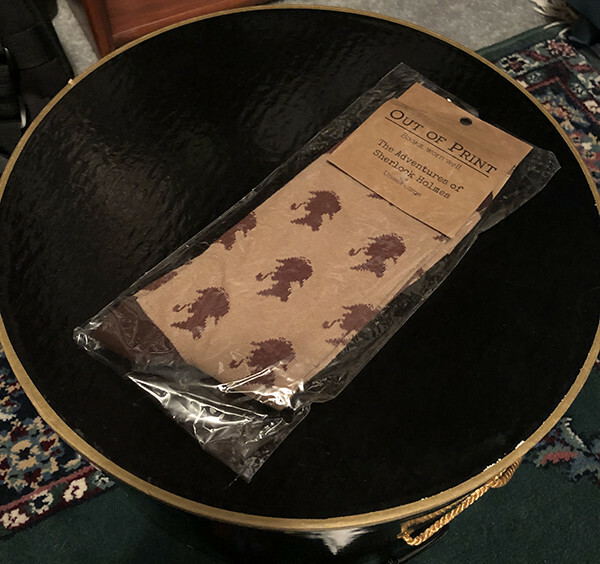 So when the subject of such novelty socks, which are typically of the thinner variety, came up, along with the suggestion that any Sherlockian should own seven pairs of said socks . . . well, I reacted . . . poorly. Further consideration suggested that I'm more of a Sherlockian t-shirt sort of fellow than a Sherlockian sock fancier. So I put out a little Twitter poll to see if I could find comfort in the validation of a few more t-shirt Sherlockians, a primary use of social media. And then I remembered that little oath repeated at the top of this essay. "All Holmes is Good Holmes." Such a challenge. In fact, those words might be the greatest real challenge in the history of Sherlockiana. Not the quizzes. Not getting an article or book published. Not attending some event or visiting some far off place. Just accepting all of it. All the non-harmful silliness that Sherlock Holmes has managed to cause since he first stepped off the page. With all of the serious, serious matters facing us these days, all of the disagreements that have actual consequences, all of the fights that we actually need to fight to make the world a better place, is there anything having to do with Mr. Sherlock Holmes that we can't just let slide on our way to doing the real work of life? And maybe just accept that whatever the thickness of their socks, other people are enjoying Sherlock Holmes in their own way just as we are? Well, there's only one way to find out. Good luck to every one of you stalwart Sherlockian heroes willing to take up that challenge. Because wait until you see what Sherlock Holmes has coming for us next . . . . If one does any study of cults that become established religions, one notices a certain pattern. There is the core figure, the one who comes up with the idea, and then there often next comes the organizer or organizers, that person or persons who build the structure around that figure and their ideas to create something that lasts and grows. This came to mind as I watched another happy Sherlockian jumping on board the new society called "Doyle's Rotary Coffin" this morning. Paul Thomas Miller came up with the society and gave it the most positive credo in Sherlockiana (or Holmesiana, given that he's on that side of the pond): "All Holmes is good Holmes." Although some might disagree with that optimistic and hopeful approach to our hobby, that simple motto is the sound base upon which much could be built. All that Doyle's Rotary Coffin needs now is its zealous adherent to build the first compound or gather a band of the disenfranchised whose spouses he or she can sleep with as a part of some later-applied cult rules. (That always seems to happen. One suspects that it's a real motivator among such cult-builders.) I'm not bringing this up as an incentive to get folks to apply for the job, mind you. "Just sayin'!" as the sayin' goes. All this, of course, is just my own very optimistic outlook on the future of what Paul Thomas Miller has created with Doyle's Rotary Coffin. The society's originator and prophet seems to be meditating upon the growing movement's future at present, and I'm eager to see where it heads. Will it be cult status? Well, we won't make that call until someone starts asking to sleep with spouses, but maybe a little cult-like enthusiasm here at the start wouldn't be a bad thing. Measuring intellect is a tricky thing, as someone will surely explain to you when the subject of "I.Q. tests" comes up. Gauging the brainpower of another human being, just from our own perceptions is even harder. What can one use as objective criteria? How much does their similarities to our own style of thinking enter in? Despite all of these roadblocks, I foolishly decided to do a couple of little Twitter polls this week, just to see what those with enough interest and energy to click a radio button thought on the matter. My initial reaction was to put the results down to just plain popularity, as the thought that Jeremy Brett could be perceived as that much smarter than the infallible Rathbone did not seem at all right. And, I have to admit a personal prejudice -- Cumberbatch had to be the greatest genius as far as I was concerned, factoring in his age alone. By the time his Sherlock was the age of Brett or Rathbone's Sherlocks? That guy would blow either of them out of the water. Jeremy Brett's Sherlock Holmes is harder for me to rate in intellect, I suspect, for the same reason others might rate him higher: He's just SO Canonical. The familiar lines, the familiar deductions, are bits of genius that a well-travelled Canonical fan might be more numb to than a more fresh viewer. And I had already read those tales a whole lot by the time Brett came along, creating pet peeves with his delivery of certain favorite lines. But did I miss a truly brilliant Sherlock in my hitting those Sherlockian high point incarnations? Is there any possibility of coming up with an objective rational for rating one Sherlock above the others, or is that an impossible quest? Maybe we'll have to find the greatest genius among Sherlockians first to get an answer to that, and I don't think that person is creating or taking Twitter polls, but I definitely could be wrong. If that's the case, let me know. I have many more questions for you. Okay, let's be honest, there are some bad Baker Street Irregulars out there. Don't go to the annual dinner, don't subscribe to The Baker Street Journal, don't contribute to the various endeavors of the group. Not really calling anyone out here, just describing the fellow who is going to write what follows, for the sake of full disclosure. He's a bad BSI. So . . . a little extra discretionary cash this year, and that 2018 Christmas Annual of The Baker Street Journal on the 1951 recreation of 221B, etc., looked really tempting. The only way to get it? Be subscribed to the BSJ for 2018, or just catch up on the whole year's worth of issues at once. The annual came first, then the winter issue, and today, the rest of the year's bundle. And with it, the opportunity to do a review of the year's BSJs all in one fell swoop. And since it had been a few years, a fairly fresh look. Taken all together, these squarebound beauties are almost an inch thick, making them basically a book. For around forty bucks, you'd usually get hardcover in a book, but five chunks of postage for the year-long rationing of a subscription, well, it's the price of nostalgia. Bought a magazine in the store lately? Yep. So, anyway, Volume 68, Issue 1, Spring of 2018. Past a couple of ads and on comes the start of the issue, "The Editor's Gas-Lamp," that odd little random musing that usually doesn't seem to have to do with the issue, and always makes me think about the ones Edgar Smith wrote back in the day. This one's a movie meander, which drops one right into an article about WWI tin boxes adapted from a paper at the 2018 BSI dinner by Ross Davies. It's followed by articles by Liese Sherwood-Fabre and Monica Schmidt, hitting the areas they go in both talk and print, so, representative of current state of Sherlockiana. What seems to be Martin Edwards's talk as the 2018 BSI weekend's Distinguished Speaker talk follows them. Sonia Fetherston comes next with the historical holders of her BSI investiture, "The Solitary Cyclist," and we are already on to the regular news features that will fill the remaining chunk of the issue. This being the first issue after the BSI weekend for 2018, there's a lot of reporting on those events once we pass "From the Editor's Commonplace Book" and "Baker Street Inventory." Oddly, the main article seems to be written by a character from the 1970s TV show, The Night Stalker. I'm not sure why he was writing the article, as it pretty much sounds like most Sherlockians reporting on the weekend -- an ever-doomed endeavor, as no reporting can ever truly reflect the full experience of being immersed in that mad social whirl. The annual overlong poem, the obituaries, and the issue is over, with no real surprises. Tradition cements a lot of the BSJ firmly in place, for better or worse. On to Volume 68, Issue 2, Summer 2018, and the hope that leaving the January weekend behind will bring something fresh. More articles this time, to be sure. A good mix of articles, with a couple of two-article themes going, some humor (thanks to Paul Thomas Miller), but almost all historical research, whether it's on the Doyle side of the fence or the Watson side of the fence. Is the BSJ, in its own way, really a historical journal? That aspect seems to be shining brightly in this issue, coming to it with fresh eyes after a hiatus. But in Volume 68, Issue 3, Autumn 2018, the lead article is on textual variations, so maybe we're getting back to the literary side of things. And we do, for a time. The autumn issue has a fascinating transition from the literary to the historical as it moves from article to article, rounding off the articles with a strong sense of deja vu as the Scott Bond cartoon turns out to be the same one published the previous issue. Volume 68, Issue 4, Winter 2018, also history-heavy, leaning toward the Conan Doyle side of the coin. Seems the articles end early, like the first issue of the year and it turns out it's for much the same reason -- event coverage. The scion reports and an article on a symposium are bulking up the features section. A few more obituaries and we're on the index for Volume 68. The year is done. The Baker Street Journal has been called "the journal of record" in recent years, and it rather suits that title. It collects and records a great many facts connected with Conan Doyle, the Victorian era (and sometimes after), and the Canon itself. Almost all serious and solid work, the journal is a Sherlockian edifice that defies casual criticism. And yet . . . .
Look, before I write anything that's going to get me those sorts of protestations that mean I've dented someone's reality, let's get back to my original disclaimer: I've been at this grand game of ours for a good forty years and outside the BSI establishment for most of that. Makes one a little jaded, so my personal perspective does not exactly align with either the diehard loyalists or the newer recruits discovering the joy of the Canon's depths for the first time. So take what follows with many grains of salt. The joy of digging up history tied to the world of Sherlock Holmes is a great personal adventure. I love it. But the presentation of one's results . . . well, sometimes it could be a little more entertaining, y'know? There was a whimsy to the early BSJ that seems missing in all the historical reporting of the modern journal, which, to be fair, reflects many a modern symposium presentation. I'm sure a few of my "old school" friends have wondered why I wander through all the Holmes-and-Watson-love-each-other fanfic of late, and comparing that to the Journal's content, I can see it's because there is whimsy there. Joy in playing with Holmes and Watson, the characters and their world, over documenting the past of our own with a few connecting links. After over a hundred and thirty years, Sherlockiana has a ton of history to revel in, which is why I bought all of the last year's journals, just to get the Christmas Annual on the Sherlock Holmes exhibition of 1951-1952. But all of that history exists because someone was having fun. (Or maybe trying to make money, but that's always another story.) And we continue to have our fun, which is why this hobby is still around. Capturing that fun with the written word, however, will always be an ongoing challenge, especially following after some of the folk that have always existed in this hobby. But as Sherlock Holmes himself once said, "Compound of the Busy Bee and Excelsior. We can but try -- the motto of the firm." And if you can find the fun in trying, well, that's what has made this hobby a great place to be all along, even if our jaded older members do get a little bored and critical now and then. The pavements of Victorian London on a given spring evening. Several obscure books, dear to the owner, fall to said pavement in the various ways books fall to the ground. To the ground. The spring, Victorian London, city pavement ground. You know the muds that a keen eye can spot on the shoes walking those pavements. You know what the horses pulling the cabs are dumping on those streets, getting dragged up to the pavements that aren't streets by those same shoes. John H. Watson, M.D., did that to those books. That same Watson is a quite popular author at that moment. At least four volumes are enjoying nice print runs due to his creation. When it comes to books, Watson is a god of books, a creator of so many books that his casual wounding of a few old specimens takes nothing from his karmic balance with the Parliament of Books, one might think. Yet those books had brethren, those books had creators, those books had a caretaker . . . family, if you will. None of those would look kindly upon Watson's treatment of their kin. Except . . . except . . . well . . . that poor bibliophile who was carrying them when John Watson committed his crime of carelessness. One might even blame said bibliophile, whose later shift of personas might lead one to believe that he did not truly love books at all. Did he see Watson and allow the books to mingle with the pavement waste, just to give an excuse for future sympathies? Or was he as Watson perceived him -- just another accident of crowded London, who dashed away from the accident as soon as he was able, rather than deal with the man who devalued his rarities? From the point of view of the books, there are no friends in this scene, playing out in "The Adventure of the Empty House." Even after the accident, the book-collector, whom Watson calls "strange" tries to sell his precious books away to Watson at first, then disregards them completely once their use to the supposed bibliophile is over. Attentive scholars know that John Watson did not even give accurate titles for those books, not caring enough for them or remembering his crimes enough to know what was printed on their covers or title-pages. With gaps on his shelves and no known books that we are certain of his ownership of, did this creator of books even care so much for their ilk as his fans might suppose? He doesn't even report helping pick those books up off the pavement. Perhaps it's not all that surprising that the books turned on John H. Watson en masse and decided to carry his literary agent's name on their covers thenceforth rather than Watson's own. Books can be a vindictive breed, which is why the technocrafters undoubtedly invented the e-book, so what happened to John H. Watson and others like him might not happen e'er again. Be careful out there on the pavements, my friends. "I assure you, Holmes, that I marvel at the means by which you obtain your results in this case, even more than I did in the Jefferson Hope Murder."" 'member when Jefferson Hope made those two guys poison themselves? 'member when Jefferson Hope died in jail from a "burst aneurism?" 'member how Dr. Watson wrote of hearing a "dull humming and buzzing noise" in Jefferson Hope's chest which he diagnosed as an aortic aneurysm? So Jefferson Hope murdered two men. And Dr. Watson diagnosed an aneurysm from a very weird symptom, unlike what would be expected from the condition. And then Jefferson Hope died. The phrase the "Jefferson Hope Murder," with its definitely singular tense, could suddenly become a point of questioning to a strict interpreter of the Canon, when those facts are considered. And a newcomer to the Canon, entering by way of The Sign of the Four could easily mistake Jefferson Hope for the victim in such a description, rather than the criminal. And maybe he was, after all. I mean, are we to believe that Stephen Moffat and Mark Gatiss made up their . . . [OLD SPOILER ALERT!] . . . ending to BBC Sherlock's "A Study in Pink," where John Watson murders Jeff Hope completely out of the blue? There is so much that doesn't make sense in the capture of Jefferson Hope, that one has to be a little suspicious of our only witness testimony. Especially when one considers the papers found in the belongings of that same witness's late literary agent that told a very different story, in which Jefferson Hope died in a different city, a city where John H. Watson was also present, even though it was a continent and an ocean away. There's a mystery to "the Jefferson Hope Murder" that still needs solving, I think. Someone might want to work on that. The Sherlockian world is full of odd little remnants. In the digital age, they seem almost silly, the little pamphlets created for a handful of friends. The idea of publishing something in a run of 221, much less the ultra-limited 17, seems almost like the work of a publishing hermit, who doesn't really want to be read. 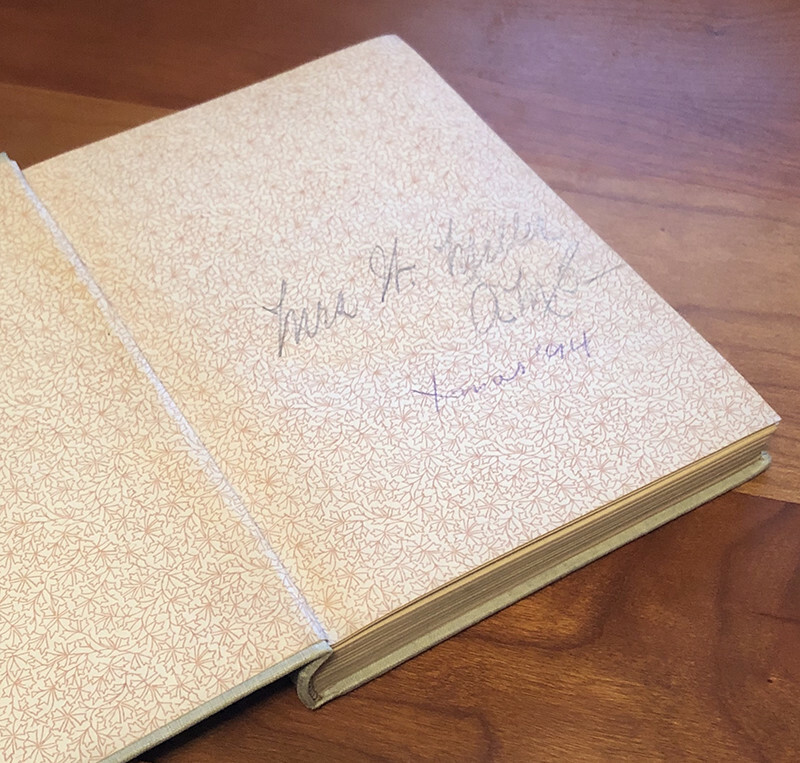 But thanks to collectors and archives, one always had hopes that such bits might eventually reach a few more readers, in that age before the internet gave us a place to spread our words. Early on, I remember concerns that digital works did not hold the permanence of paper. But electromagnetic pulses and fires seem equal threats, and both of those fates are far outweighed by the mild-mannered fate of simple disinterest. As much as we might love the book in theory, there are those members of that species who never get looked at again, even if they have a nice secure shelf home in the most climate-controlled of vaults. Ah, but don't let me get to cheery here. For the joy of any written work was never its longevity, but the moments of creation, the moments of connection, the moments of discovery, and, maybe, those moments of remembering. If I seem a bit philosophical this evening, it's due to being reminded of some of that printed residue that I've scattered in my wake over the years, a group of items produced under the banner of "Baker Street Digressions." Not really a publishing house, but a logo I'd throw on party favors for friends, Baker Street Digressions put out small monographs, pamplets, one odd little attempt at hand-making a hardbound book, some weird translations, and even some fanfic inspired by the X-man Wolverine. (Hey, it was the 1980s. "Things were different at the time." Actually, no they weren't, we just did what we could with what we had.) The earlier half of these things were actually printed with ink down at the local PIP Printing outlet. The latter took advantage of toner copying, so those words will probably fall off the page faster at some point. But the words had to get out somehow. Anyway, below is a photo of most of these paper remnants of my Sherlockian past, followed by a list of what I still remember. You never know what I might have forgotten over the years. Concerning the Later Life of the Maid Agatha, with some Sidelights on the Disposition of Another Canonical Figure of Note, a mini-monograph, December 1981, limited to 50 numbered copies. "Very Hansom of You, Mr. Holmes"by Brad Keefauver, standard BSD format, September 1982, limited to 100 numbered copies. HOLMES!, introduction and prologue, standard BSD format, December 1982, limited to 17 signed copies. The Adventure of the Drowned Carp by Henry Watson III, standard BSD format, undated round robin by Tom Simpson, Bob Burr, George Scheetz, Alex Ciegler, Janet Ciegler, Brad Keefauver, Kathryn Carter. Standard BSD format, published serially, one chapter at a time. Prologue and chapter one, May 1983. The Seventy Proof Solution: The Simpson-Burr Debate over the True Condition of Dr. Watson by Tom Simpson and Robert C. Burr, standard BSD format, September 1884. The Laundrylist of Sherlock Holmes, standard BSD format, collection of mini-pastiches by Bob Burr, Brad Keefauver, Kathy Carter, Tom Simpson, and Ed Connor. The Annotated John Clayton, 5 1/2 by 8 1/2 format with pullout map, September 1988. Trapping the Neighbors on Baker Street by Brad Keefauver, BSD format, May 1995. Highlanders: The Pocket Fanzine,paperback, May 1994. Coffee with Mr. Sherlock Holmes,standard BSD format, limited to 9 numbered copies, 1994. A Pocket Full of Sherlock Holmesby the Fore of the Scions, paperback, September 1996. Another Pocket Full of Sherlock Holmes by the Fore of the Scions, paperback, September 1997. The Adventure of the Dancing Men by Arthur Conan Doyle in Dancing Men Code, 4 1/4 x 11 format, undated. The Weekend at Baskerville Hall book, 1999. 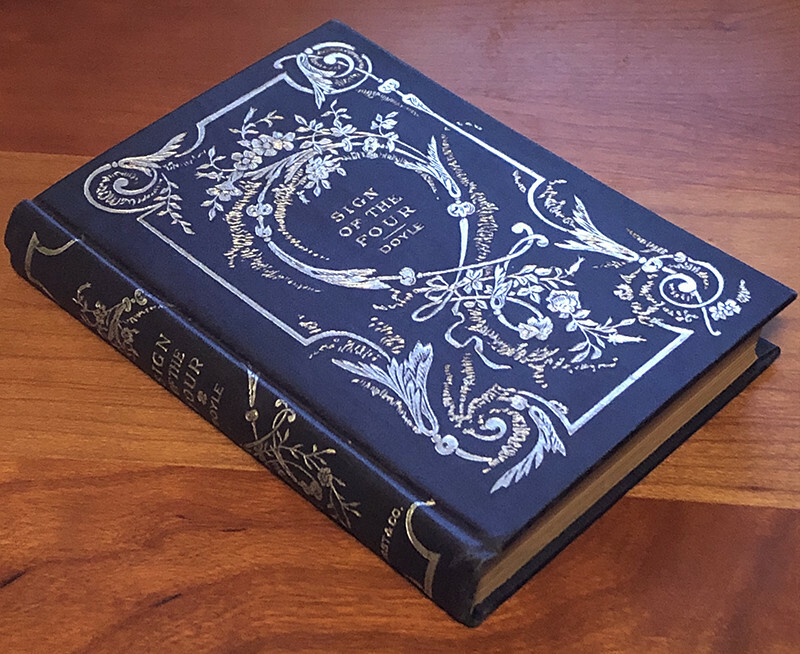 The Palimpsest of Gloria Patri,The Scott Edition, Translated by Dellon P. Arthur, Mitchell O' Conan, Paster Johnson Doyle (a Hudson's code translation of "The Gloria Scott"), limited edition of sixteen, uncorrected proofs edition, June 2001. The Rest Is Legend: The True Facts and Tall Tales regarding John Clayton, Cabman, 5 1/2 by 8 1/2 format, September 2001.
Who Are the 4? The Ancient Secret Society Hidden in the Pages of John H. Watson's The Sign of the Four by Alex Bernstone, 2005. The Sherlock Texas Diaries: Expedition Notes and Commentary from Mike Miller, Don Hobbs, and Brad Keefauver, 2005. A Study in Scarlet, Part Two, Chapter Three, Deseret alphabet edition, 2005. The Watson Discontinuity, 2017 221B Con handout for "Arthur 'Continuity' Doyle" panel. Dr. Watson's Little Book of Problems, 2018 221B Con handout for "Arthur 'Continuity' Doyle" panel. Sherlock Holmes is Real, podcast beginning in November 2017. Rituals, those things that depend upon a repeat of a previous thing, be it in religion or football, have always been a tremendous bore to me. While re-reading a book or re-watching a movie again and again might be comfort food to some, my own personality continually drives me to the new. So why is it that I continually come back to the Canon of Sherlock Holmes? Because, through some arcane process Conan Doyle ingeniously concocted words that seem to change with focus, revealing brand new stories every time. This morning, for example, Scott Monty tied a little essay on the word "incorrigible" to a new cartoon from the Mason pater-and-filius team. John Watson and wife number whatever seem to have a servant girl named Mary Jane in "A Scandal in Bohemia" who is just incorrigible, which for some reason has always had a connotation of "cute" to me. Scott points out how incorrigible is like the word irredeemable in his essay, the latter definitely being the word to use for a non-cute habitual ne'er-do-well. "It is true that I had a country walk on Thursday and came home a dreadful mess, but as I have changed my clothes I can't imagine how you deduce it. As to Mary Jane, she is incorrigible, and my wife has give her notice . . . ."
Why was Watson going on a country walk? Especially under such conditions that left him "a dreadful mess" -- the sort of day one would not choose to go for a country walk. Or was he just a dreadful mess emotionally from the thoughts he had during that walk? A country walk seems to imply Watson had to just get out of the house to think. So, let's put it all together with the context surrounding that walk. Something is troubling Watson, so he went for a walk. Shortly after returning from that walk, and his thoughts therein, he walks through Baker Street, sees "the well-remembered door, which must always be associated in my mind with my wooing, and with the dark incidents of the Study in Scarlet." (Only two people getting together in that story, you may recall, and neither of them was named "Mary.") An adventure with Holmes ensues, and then John Watson writes it up with the opening sentence "To Sherlock Holmes she is always the woman . . ." or "Hey, reading public! Sherlock Holmes is definitely heterosexual!" To paraphrase that old faux Freud quote: "Sometimes a country walk is just a country walk." But the walk is there, and definitely an important enough point that Watson puts it in his chronicle, instead of just "my shoes got some mud on them the other day," which would have sufficed to explain the condition of his boots and Mary Jane's treatment of them. Though it is hazy and half-seen, there is a story there, in that mention of a country walk. And the Sherlockian mind reads those words just a little more intensely once that story is glimpsed. It's a part of the magic that Conan Doyle imbued these works with, and a source of never-ending fun if one lets imagination dance upon them. And one more reason that Sherlockiana is such a damned lovely hobby. Perusing the web at lunch today, I came across something written a month or so ago at which I took some umbrage. I don't know if we can use that word any more without sounding villainous, thanks to J.K. Rowling, but I found the piece rather annoying in that sort of way that makes one want to take up the lance, mount the charger, and ride straight at the source. All of which is just the fah-ncy way of saying, yeah, I'm pissed, you're full of crap, and now you're going to get an ear-ful. But we're Sherlockians, we've long loved to go fah-ncy with our verbiage, even when posing for the effortless-looking riposte designed to deliver a surgically precise cut with maximum sting. And that's really a healthy mechanism, because if you're spending some thought on your words, you're giving yourself time to cool down a bit, consider the damage, and maybe even realize that your target is a human being whose road might have not been pleasant in taking them to this disagreeable place at which you have just encountered them. Words are very helpful that way, and Sherlockians are a people of words, even if we come to the fold from movies or television. (In fact, I would even argue that those who came from a recent television show may have produced more words about Sherlock Holmes than any prior generation.) And we need to use our words now, more skillfully than ever before, so that is a very good thing. And yet, sometimes, we can still love those same words too much. If you just spent two hours at the keyboard spewing out a tirade of righteous anger, with God and all his angels of goodness filling your sails and pushing you forward in fierce arguments and justice-wielding fire, well, it can be hard to just let those words go. To delete such raging children of our mental voice would seem a crime . . . and yet . . . should we unleash them upon an unsuspecting world? Diaries were once the perfect cage for those beasts, but now such innovations as the blog puts those cages in a public zoo for all to visit. But still, we have to use our words. And we have to think about those words as we do use them. So, use those fah-ncy words wherever possible, just like such proper Victorians as John H. Watson, M.D., and his friend Mr. Sherlock Holmes. They might even cool a fevered brow upon occasion, just as the good doctor helped me with today. The watchalong and I have never really gotten along. Once upon a time, I attempted to follow that well-meaning commentary that accompanied the first episode of BBC Sherlock way back when, but the show was too good and any chatter from even an illustrious peanut gallery just seemed like unwanted static. Later watchalongs, based on Granada episodes didn't seem to do it either . . . either the tale was too familiar, or it just wasn't the right commentary crowd the nights I took it in. But tonight, in Super-Bowl-avoidance mode when Chris Redmond suggested the 1955 Boris Karloff TV adaptation of H.F. Heard's A Taste for Honey, well, having never seem it before, it seemed like a good time to give it another try. This old TV episode from The Elgin Hour, called "The Sting of Death," is quite a lively little thing, turning a serious mystery novel into a bit of a comedy murder mystery, when the murderer is never really in doubt from early on. And it's main character, Karloff's "Mr. Mycroft" is a retired fellow who keeps bees, can make observations about the mud on a fellow's shoes, and can fall down in fake illness when he needs to check something out. In other words, this guy is Sherlock Holmes under an assumed name. Mr. Silchester, who serves as both client, Watson, and victim, in this tight little four-actor play, is almost comically fond of honey. His housekeeper Alice is the queen of exposition, announcing characters dying off-screen when needed (and I think her -- Hermione Gingold's -- voice was behind the off-camera Mrs. Hargrove as well). The obvious villain, Mr. Hargrove is so Moriarty-ish in his look that there is hardly a moment of doubt who is behind it all. And Boris Karloff is about the creepiest version of Sherlock Holmes (despite the brother's name) ever, with some of his lines sounding more ominous than anything by Rathbone, Brett, or Cumberbatch. "A Sting of Death" is a talky show, so full of verbal spillage as to make it impossible for a spoken Mystery Science Theater 3000, but a written one, as Twitter supplies, fits it perfectly. The show is goofy enough on its own to do with some accompanying commentary, especially when the 1950s language starts sounding full of double-entendres. But, basically, a watchalong is about community, and sharing in a Sherlock Holmes related bit of video that was new to most of us, yet of a sort that didn't want "full immersion" to be enjoyed, was the perfect choice for such an event. Chris suggested doing future watchalongs with some of the odder corners of Sherlockian video, and tonight's "Sting" was a good test of that. It's going to be a bit before Holmes and Watson hits DVD, or Elementary's final season airs, so why not? This January marked the end of Mike Whelan's era of managing the Baker Street Irregulars, and one of the hallmarks of his time in office has been the immense output of the BSI's publishing arm. So, in honor of this event, I spent a one of my cash Christmas gifts and picked up a couple volumes from the BSI Manuscript Series, which I had fallen behind on some time ago. First was Out of The Abyss, the "Empty House" manuscript and accompanying materials. Since "Empty House" is a key point in the Canon, this was a no-brainer, and the volume contains several essays by writers I enjoy, though, sadly, none from The Occupants of the Empty House, the society whose members have written more articles on that story than any other. The second volume was Dancing to Death, the "Dancing Men" manuscript, with an even more attraction list of contributors, and the distinction of being the only original manuscript I have ever met in person, one amazing weekend in Dallas with my ol' buddy Don, who contributed an essay to the book. The Winter 2018 issue of The Baker Street Journal coincidentally arrived the same day as the pair, featuring an article by Nicholas Utechin on all the known Doyle manuscripts of the Canon and their published versions. The fact that such hand-written originals exist, complete with all the cross-outs and first thoughts, in a day when such things just aren't makes them all the more magical to our eyes. Bits and bytes in a word processing program will never have the same arcane properties, even though they are functionally much more "magical." The non-manuscript parts of these volumes always make me a bit nostalgic for an ambitious series begun by Calabash Press back in the 1990s. Calabash was publishing collections of essays on each of the Canonical tales. The effort made it to at least four volumes, MUSG, SPEC, DYING, and BLUE, with an impressive array of Sherlockian writers of that era, and while we all hoped that the series would reach a full sixty volumes, we also knew that was perhaps an impossible dream. (Great while it lasted, though!) And since, as Nicholas Utechin points out in the latest BSJ, there are only 37 known Canonical manuscripts, the BSI series will probably not hit that dream number of sixty as well. Still, we always wish for that which we can't have, don't we? And the Manuscript Series, like the Beeton's Christmas Annual reproductions, gives us a chance at a simulacrum of something any Sherlockian would love to possess, even though the actual chances of doing so are, for almost all of us, nil. "We now pass on to the dating of the various pieces, so far as it can be determined by internal evidence, implicit or explicit." 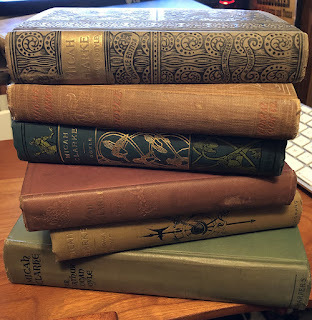 Having a copy of Ronald Knox's essay "Studies in the Literature of Sherlock Holmes" at hand for a regular re-visit gives one a good perspective on this hobby of ours and the wealth it offers. For the student of Sherlockian chronology, Knox spends a few short pages with history's first known attempt at that field of study. True, he was working with the forty-seven (or less) story Canon of that era. And it is extremely basic, placed next to later, book-length, entrants to the field. But Knox was the first. He dates A Study in Scarlet in 1879 without giving us his rationale. He also does this with several of the stories he assigns to 1888. But when it comes to The Hound of the Baskervilles, Knox starts bringing history external to the Canon into the calculation: Hound had to be before 1901, as old Frankland's lawsuit case is versus "Regina," indicating a female monarch was still on the throne. Knox is the first of the Watsonian Monogamists, attempting to reconcile the order based upon the doctor's marital status. And yet, while he seems loyal to that concept, Ronald Knox still seems to allow room for theories that some of the Watsonian writings are completely made-up. That particular concept is one that Sherlockians were quick to leave behind, as it's a very slippery slope. Knox's 1912 essay is a very busy bit of work, and it's only right that the father of Sherlockian scholarship should be the father of Sherlockian chronology as well. Or at least that's the grander, historical way to put it. A more familiar way might be to just say that, like so many of us that dive deep into Watson's writings on Sherlock Holmes, the Charybdis that is "trying to put the stories in order" pulled Ronald Knox down just like we who came after. The economics of Sherlockian life sure take a lot more thought than they did in the 1980s. But then, it's not just us. Before I got into Sherlock Holmes, my first love was Marvel Comics. As a kid with a five dollar a week allowance, I could afford to buy every superhero comic Marvel put out, every month. Now, as an adult with a good job, with many a Marvel Comic costing that same five dollars by itself, I can't replicate what I did as a kid without some major impact to the household budget. And when I got into Sherlock Holmes in college, and came out of college with a starter job and a starter paycheck, things were much like they were with the comics. I could afford to buy every Sherlock Holmes book that was newly published without putting any real dent in my household budget. And as the eighties went along, I also started subscribing to every periodical as well. Not a problem. Now, making over twice what I did then, I subscribe to very few journals and choose my book purchases with care. I could probably do more by sacrificing some other things, but even the guy who writes about Sherlock every day he can isn't that obsessed. This is a very different world from that of twenty or forty years ago, but not without some changes to fit the new landscape. While the older generation makes its literary mark by gathering and publishing the works of the past in volumes collectors can archive for reference, much of the younger seems to be following a different path . . . building up their writing and networking skills. Publishing fanfic in the internet, helping beta that work, and enjoying same costs not more than an internet connection. But whether it's the free side of the hobby or the collector-with-means side, I'd like to see the person who manages to read everything. Because there are surely as rare as hen's teeth. We have more opportunities than ever before and less resources to take advantage of those opportunities, old and young alike. And our awareness of those inequities is greater -- we know exactly which of our friends is flying across country (or an ocean) to a Sherlockian event. So where do we go with this? Well, for those of us that were around in 1985, acknowledging that the world is a different place than it was in 1985. Figuring out who we want our audiences to be and look at their situation. Maybe even just showing a little empathy toward Sherlockians who aren't in our immediate circles, and think a little less of ourselves as times get tougher . . . a direction they sure look to be headed. Sherlockiana is a community, like any other, and the same principles apply. Common sense, 'tis true, but also something to think upon now and then.